Dr. Denise M Arcand, MD is a Doctor primarily located in West Warwick, RI. Her specialties include Family Medicine. She speaks English. Dr. Arcand has received 4 awards. The overall average patient rating of Dr. Denise M Arcand is Great. Dr. Denise M Arcand has been rated by 22 patients. From those 22 patients 7 of those left a comment along with their rating. The overall rating for Dr. Denise M Arcand is 4.3 of 5.0 stars. This doctor decided to agree with a bad decision at the Riverview Nursing home where my Mom was a resident for almost a year under her care. She allowed Med Options to take her off medications suddenly, without weaning her down like was the right thing to do with these kind of drugs. The Fatima Hospital emergency room doctors told me this was not right as my Mom was in panic attack and withdrawal at 87 yrs old and suffering. They should have let the HOSPITAL do the wean down from the drugs if they really cared. My Mom has died a few days later. I don't think this doctor ever did examine her in person within this time frame that she needed some care plan. Then, she just allowed they to send her out to the hospital as she didn't want to be bothered to find out the truth. I am very sorry that I put my Mom under her care and especially Riverview Healthcare in Coventry RI. By the way, the day before she died they told the hospital staff that she would not be allowed back there to live. The doctor did nothing to help this situation. She didn't even try as far as I know and she never called me as her health care POA after she died to say she was sorry. The way all Doctors should be. Denise is following in the footsteps of her father who is and always was a great doctor. When I had a bit of a heart thing, Denise was at my bedside quickly and did a full exam and discussed my case with the cardiologist. She took her time and made me feel just perfect. This is the way doctors should be. can Never get through the phone line is ALWAYS BUSY!! Takes the time to listen to me. The others that work with her in her office! Dr. Denise is an amazing doctor, however, I also see some nurse practioners in her office. I started by seeing Robin who is not only a kind, courteous person but her knowledge in medicine is extremely thorough! She was too busy to see me one time, which I can understand, so I had to see Richard. He is also a nuse practioner in Dr. Denise's office. I was unable to keep my morning appointment so I called to reschedule for later in the day 1:45 pm to be precise. So I showed up at 1:35 pm and the receptionist was very pleasent as she led me into the room. I got in the exam room sat down and waited about two minutes when Richard came in and proceeded to say "You know you can't come in here just anytime you want, I have appointments to keep and you just can't show up anytime you want." I was taken back by his comments, first of all I was there to get the final check on my PPD exam which I could of done by myself. Secondly it takes about five seconds to check, and the receptionist told me to come in at that time. The tone of his voice and his approach towards me was VERY smug and rude. I'm not rude to him when he leaves me waiting for over a half hour in the waiting room. Ethics, maybe he missed that class. Not that it matters, but the reason I couldnt keep my morning appointment was that I had to get my four year old daughter earlier than expected, so she was also in the room to hear this unprofessional man talk to her father in such a rude manner. 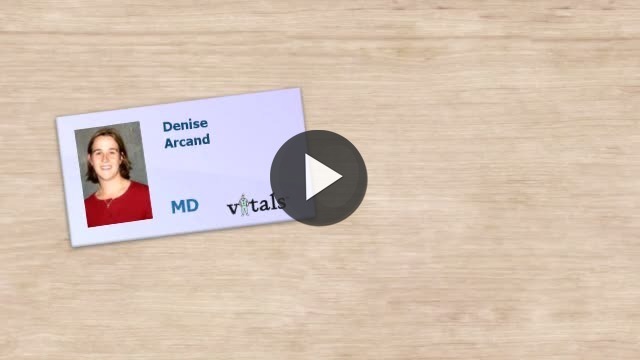 Take a minute to learn about Dr. Denise M Arcand, MD - Family Medicine in West Warwick, RI, in this video.